Ever feel stuck? If so, you can use the law of "as above, so below" to restart the flow in your life! What does "as above, so below" mean? It means that the different levels of our lives - mind, body, spirit - are all connected, so if you're stuck on one level, you can create flow on another level, which creates flow throughout your life. What does this look like on a daily basis? Here are four examples of how you might change various "stuck" situations. This usually occurs on a mental level, so you want to create flow on the physical or spiritual levels. On the physical level, sit in a relaxed position, and take quick darting glances around you - never let your eyes linger on anything for more than 2 seconds, and vary your gaze so that you look at things both close to and far from you. Do this for 3 to 5 minutes. You can also do any kind of physical exercise to get things moving. On a spiritual level, prayer, meditation, reading spiritual material, or any activity that raises your vibration from the mundane to the spiritual, will create flow. 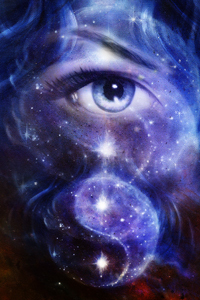 Increase Your Psychic Ability to "See"
The ability to see psychically is a spirit perceptic, and can be improved by working with your physical vision. Notice in your daily life how far out from your body your eyes tend to rest. Do you generally look far or near? Do you ever look to the sides, up or down? Wherever you fail to look, begin practicing putting your eyes there. When you drive, practice looking far out ahead of you while maintaining contact with what's right in front of you. The more you practice the physical perception of seeing, the more you will be able to see psychically. For more exercises on increasing your psychic abilities, see our Psychic Development ebook. The body registers all that happens in mind and spirit. Certainly physical stretching and practices such as yoga are beneficial. To enhance these practices, start noticing areas of resistance in your life created by conflicts between mind and spirit (what you think and what you inherently know) or conflicting beliefs. Simply stated, look for any situation in which you feel irritated, angry, nervous, anxious, depressed or moody. Then, either by yourself or working with spirit guides, begin to work on acceptance. In the moment, this means noticing the negative emotion and being passive to it for a moment or two. Whenever we feel negative emotion, we tend to express it physically - we pace, jig, make faces, tense parts of our bodies, or twitch. If you can still these physical responses and make your internal reaction passive for a moment or two, you'll go a long way toward making your body more flexible. If you ever feel cut off from your spiritual connection, it's likely that you are dwelling too much in mind. The easiest solution is to get back into physical sensation. Do something that produces a lot of physical sensation - exercise, massage, roller coaster ride, eating strongly flavored food, or just moving sensation around your body. The more you stay in connection with physical sensation, the less you will be in mind, and the more you will be spiritually connected. These are but four of the millions of ways you can use "as above, so below" to move yourself out of any stuck area of your life. Get creative and come up with more ways yourself to magically break out of the stuck place you're in.